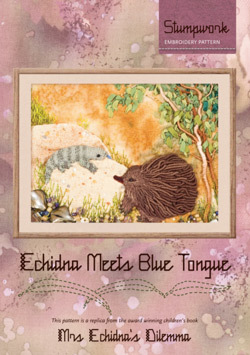 "Echidna Meets Blue-Tongue Pattern - Stumpwork" is a replica of one of the illustrations in the book 'Mrs Echidna's Dilemma'. This embroidery features large bullions, detached button hole stitch, ribbon embroidery, beading, feather stitch, outline stitch wrapped stitch and satin stitch, as well as needle-turned applique technique for the 'rocks'. The background fabric chosen sets the scene. The pattern includes step-by-step instructions and detailed illustrations. It is suitable for an intermediate embroiderer who would like to try some stump-work. There is no 'wiring' of elements in this embroidery.